Department of Labor regulations require that every fiduciary and every person who handles funds or other property of an employee benefit plan be bonded. The purpose of this bond is to protect the plan against loss due to acts of fraud or dishonesty by the persons who are required to be bonded. The bond must be for at least 10% of the value of plan assets. The bond can never be less than $1,000, and the maximum bond needed is $500,000 with respect to a single plan (unless the plan holds employer securities). Generally, the amount of the bond must be based on the highest amount of funds handled in the prior year. Typically, this will be the account value at the time you renew the bond for your plan or the account value at the end of the preceding plan year. Many insurers will offer bonds where the bond automatically adjusts with the plan assets size or bonds that renew over a certain time frame such as 5 years. If this amount cannot be determined (because the plan is new, for example), Paragon and your financial advisor will help you determine a reasonable estimate. Click here to understand coverage and purchase. 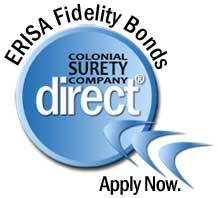 Click the icon below to get a quote and/or purchase ERISA Fidelity Bonds through Colonial Surety.